The expansion of social networks has made social capital a mainstream term in our society. Wikipedia defines social capital as the connection within and between networks. Essentially, it’s about the value of your relationships. The bigger your network, the more access you should have to jobs, information, and supports. Right? Well, not quite. Social capital also has a diminishing return. Image that you live in a society where everyone is a “friend” of everyone else online. Then, membership becomes less valuable. 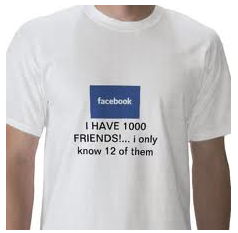 A surplus of friends in your network is likely to bring down the value of each individual friend. It is like being in a club where everyone can get in. You are likely to get less social capital out your membership even though the value of the overall network is bigger. As social networks expand, so do online groups. These groups have mushroomed across social networks such as Facebook and LinkedIn. They provide a tighter community with higher level of social capital for its members. A good example is Northwestern University, which I attended for grad school. The University has alumni online groups at the university, school, program level. I think these groups present a great opportunity and challenge for marketers: an opportunity to deliver a more value to its members, and a challenge given the lower scale and higher sensitivity for privacy.